1. 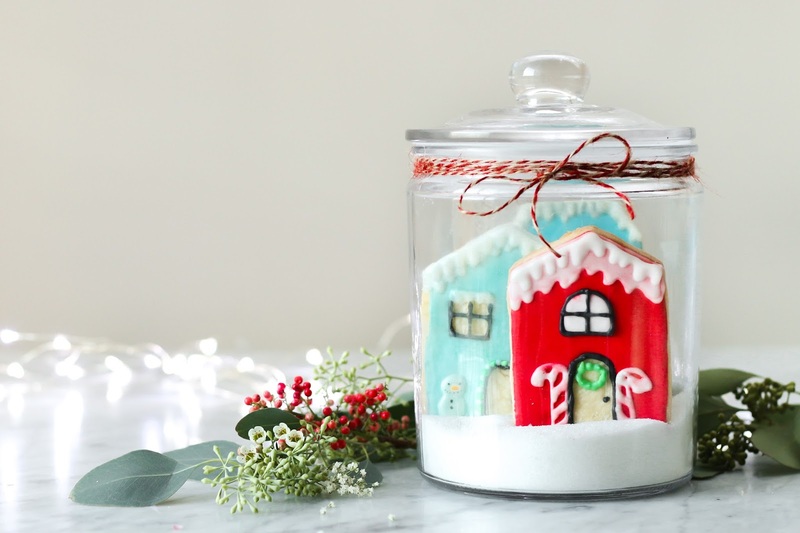 A large glass cookie jar (preferably one that has an airtight lid so you can make your cookie jar ahead of time and keep your cookies fresh). I purchased mine from a dollar store for around six dollars. 2. Your favourite gingerbread, shortbread, or sugar cookie recipe. You want to use a cookie dough which you know will not expand or change shape upon baking. Crisp, straight lines are the way to go! An extra step to ensure your cookies do no change shape while baking is to chill the cookie cut-outs thoroughly before you bake it. I popped my cut outs in the freezer for about 15 minutes before baking. 3. I used 3 - 5 cookies for each jar. 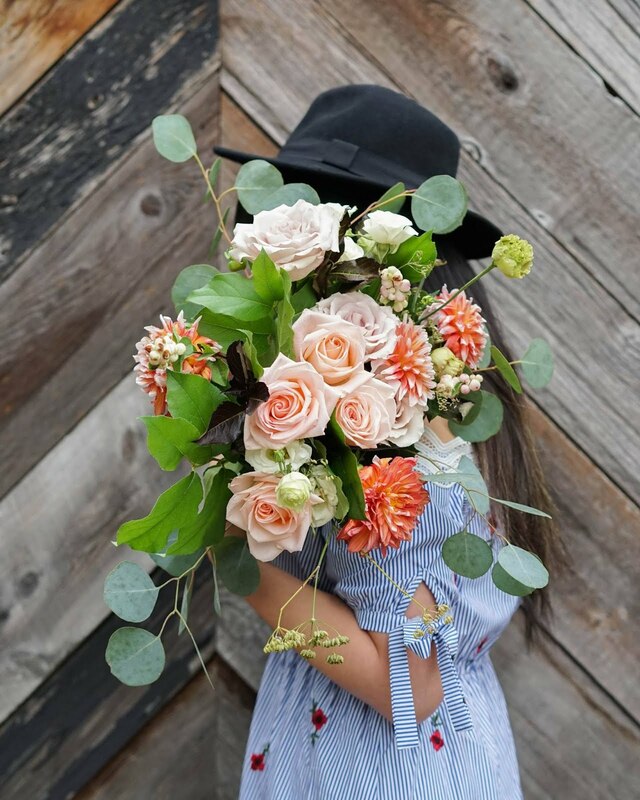 You can use more or less depending on how you want it to look. 4. 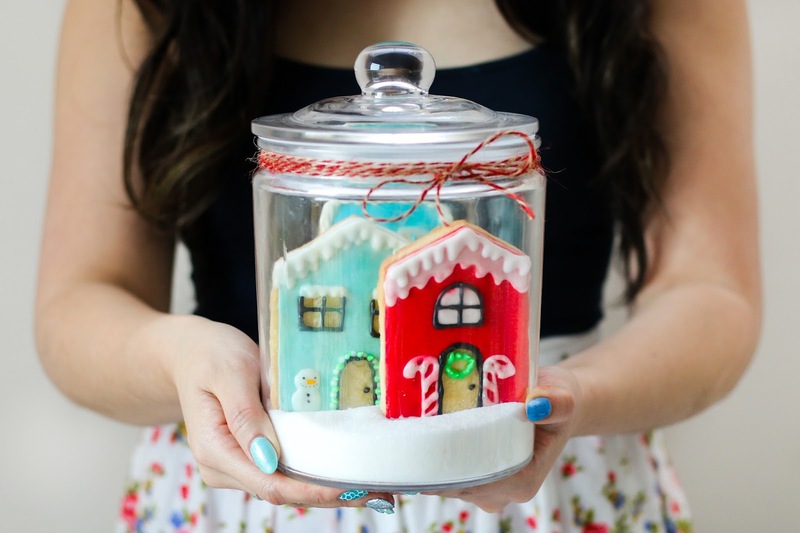 Wait until your cookies have completely cooled before decorating. We do not want the icing to become a soupy mess! 5. 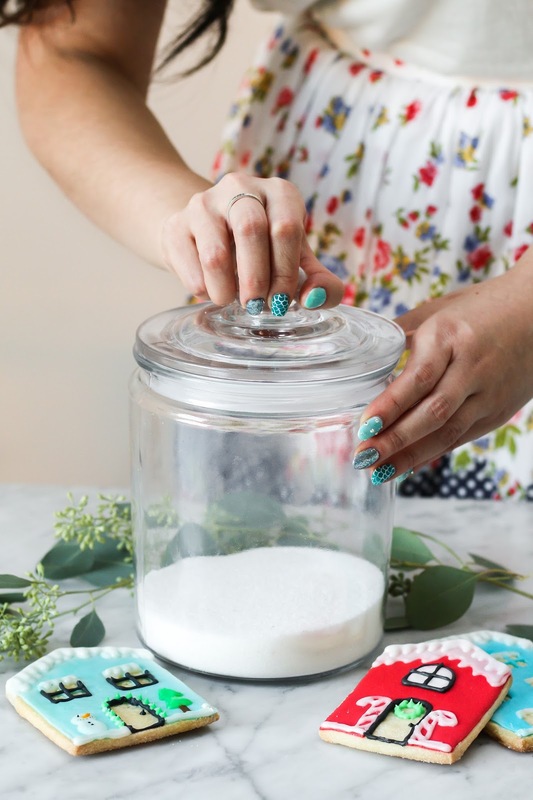 Use a good royal icing recipe for decorating. My go-to recipe is the one from Wilton that uses meringue powder. I generally use a little more water (~ one extra tablespoon) than they suggest on the website. 6. Have patience! Have patience when decorating your cookie (it takes a deceivingly long time to decorate a cookie) but you want to give yourself sometime between switching colours of icing if you want a more 3D pop-up effect with your second colour. For example, I let my blue icing of my house's base colour dry before using white icing to add the snowman and green icing to create a tree. I let it that layer dry a bit before adding the eyes and nose for the snowman. 7. 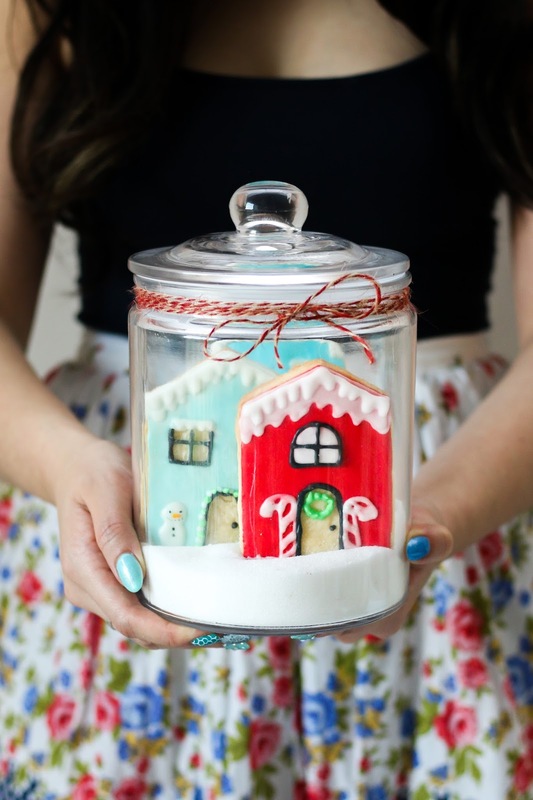 I used granulated sugar as the snowy base of my cookie jar and gently tucked the cookie houses into the "snow." 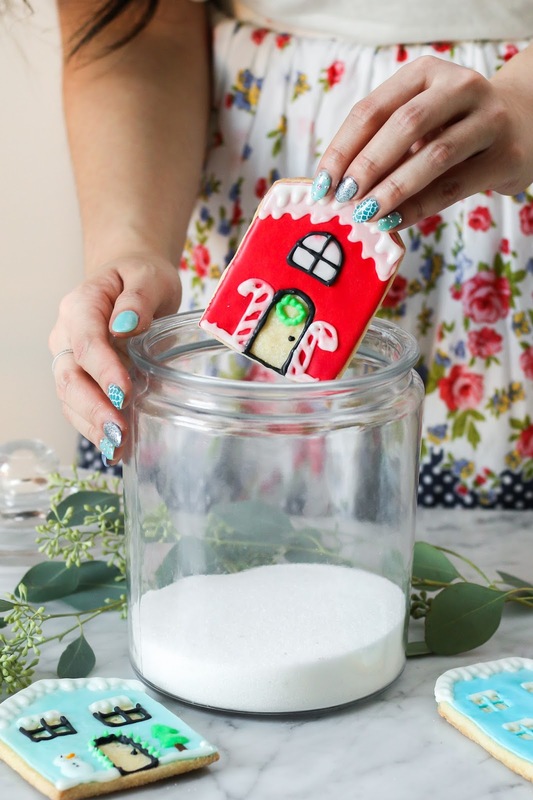 If your houses have trouble staying up, use royal icing to attach half a popsicle stick on the back of the houses with and 1 - 2 inches of the popsicle stick poking out at the bottom. The popsicle stick will help anchor the the house deeper in the snow. 8. Also have patience when you let your cookies dry. Do not try to tuck any wet/semi-dried houses into the sugar snow. It will ruin all your hard work! 9. 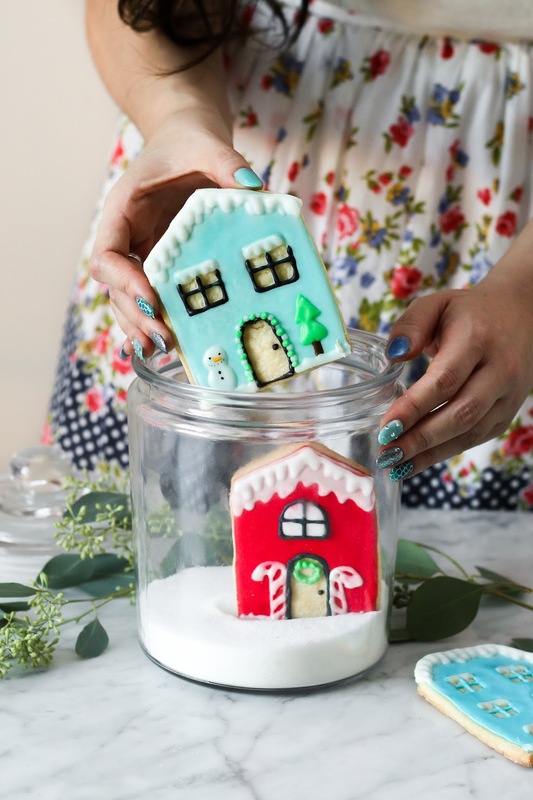 Other cute decorations you can add to your village cookie jar: fake mini Christmas trees, reindeer figurines, and mini gingerbread men as villagers! 10. Tie a ribbon and a gift tag at the base of the lid for an extra touch. That's it! 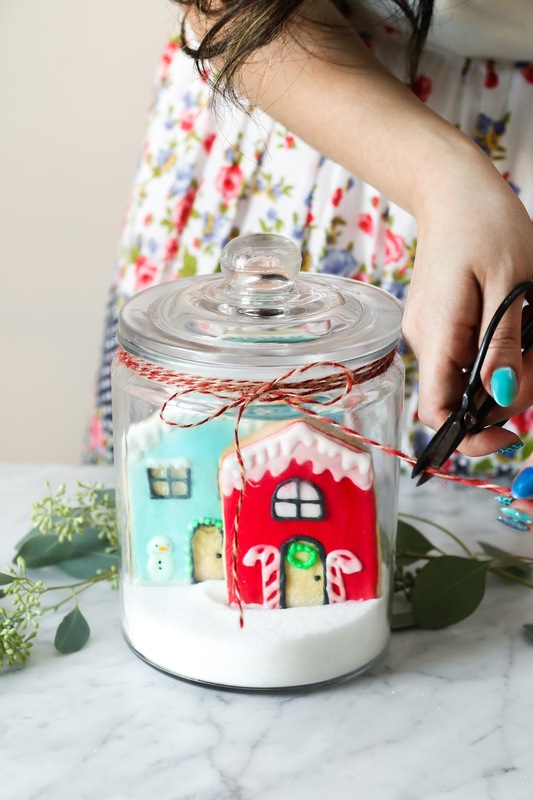 Those are the steps I took to construct my snowy village cookie jar — I hope you found them helpful. Now that I have posted my first holiday recipe/DIY gift guide, all the festive recipes are just going to keep flowing on my blog. Stay tuned! These are the cutest damn things I've ever seen.